Listen, you win some and you lose some. Sometimes you’re the least popular, but at least you can console yourself that you’re super highly rated (because no one else has read it to give it a worse review). And if you’re into slicing and dicing bookish stats, and you track the books you read on LibraryThing, you can see a whole heck of a lot about what you read and when there, too. Well, it wasn’t meant to be this time (like last time). 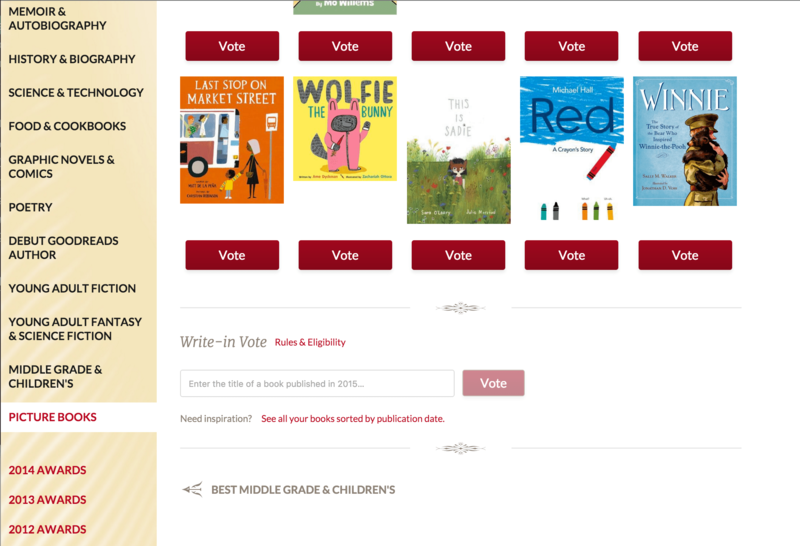 The Little Red Publishing Hen, despite all of your votes, did not make the semi-finals of the Goodreads Choice Awards 2015. I appreciate all of your efforts and hope you enjoyed the story. But, for the meantime, it’s back to scoreboard-watching and hoping our author scores a goal or at the very least racks up a few more penalty minutes. A Vote for The Little Red Publishing Hen is a Vote Against Big Picture! Listen. What I’m about to tell you may shock and upset you. For a great many people it won’t be surprising, in the least. But I feel it needs to be said. For too long, Big Picture has run the picture book business. You know who I mean. Mo Willems. Oliver Jeffers. Drew Daywalt. Maurice Sendak. Sandra “Big Town” Boynton. Do you guys really want Big Picture to continue to dominate our picture book lives? 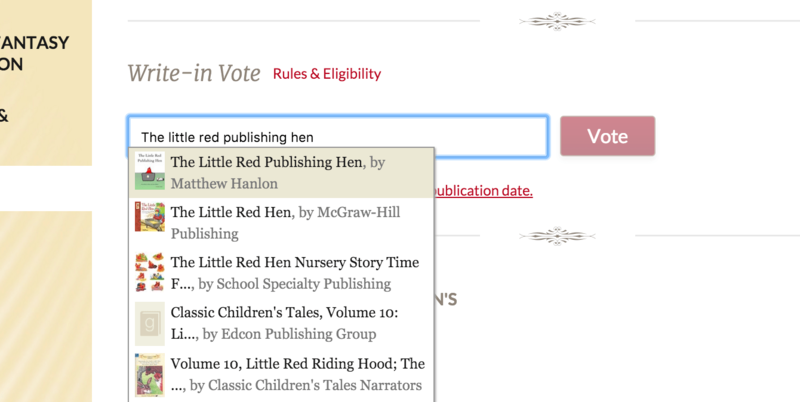 Well, if you don’t go out and vote for The Little Red Publishing Hen in the Goodreads Choice Awards 2015, that’s what very well might happen. We may wind up living in a world of lawlessness where pigeons harass you to borrow your car (despite not having a license), animals are encouraged towards slothfulness with an excessive number of naps, and unionized crayons. Do you really want that? Do you want that on your head? I don’t think you do. 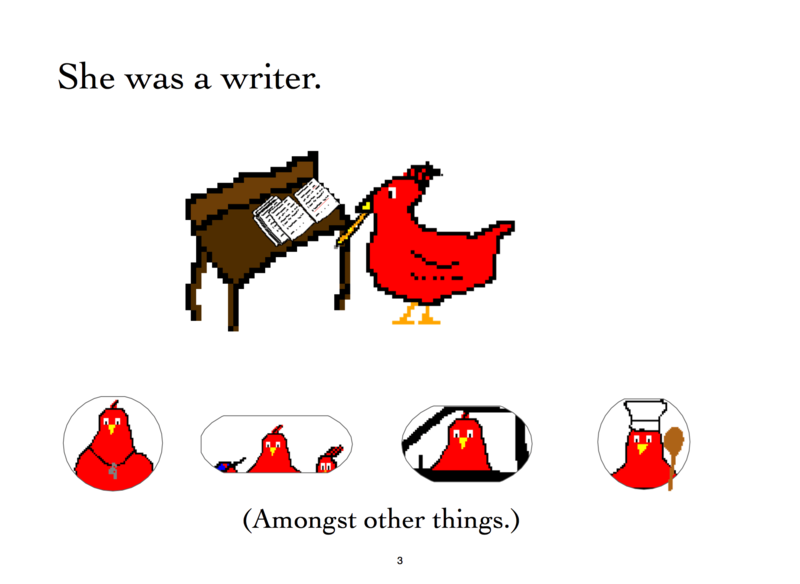 But a world in which a plucky young hen can raise a family (and all that that entails), write and then publish a book? Well, sir and or madam, that’s the kind of world I want to live in. 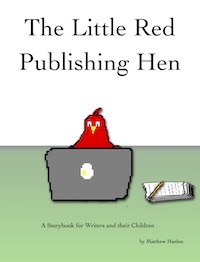 So this November 6th through the 8th or so, I want you to get out there to the polls and show Big Picture the type of stories you want to see, and vote for The Little Red Publishing Hen (instructions here for those of you just joining us). Also, here’s a very personal anecdote, from 2013. In 2013 a plucky young fish roared into the Goodreads Choice Awards, full of hope and vim and vigor. He kept up with those giants of Big Picture for a few days but was ultimately cast aside in favor of Drew “Da Hammer” Daywalt and Oliver “Bearpaws” Jeffers and their evil army of lazy crayons. Don’t let the same thing happen again. Please don’t let the same thing happen again. Please get out and vote for The Little Red Publishing Hen. 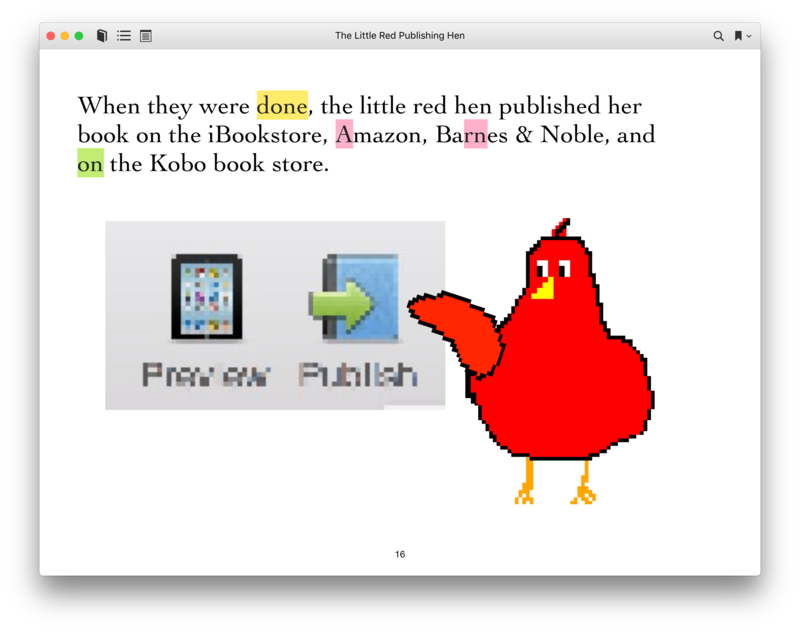 Find a relative who may not yet be connected to the internet, connect them to it, and have them visit the Goodreads Best Picture Book page and write in “the little red publishing hen”. Or at least create an account in their name and then vote for them. Don’t let Big Picture tell us what to do, vote for The Little Red Publishing Hen! 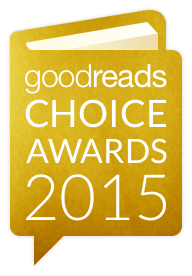 Vote for The Little Red Publishing Hen in the Goodreads Choice 2015 Awards! Please. This is going to remind people, people who have long memories, of another time and another place. So I’ve been told I’m not allowed to go around people’s houses, sign them up for Goodreads accounts, visit the Best Picture Book page, write in The Little Red Publishing Hen and vote for it for best picture book any more. But, what I can do is tell you how to do it yourself. First, visit the Best Picture Book page. Next, log in or create an account on Goodreads (it’s free!) and come back to that page. Step 2: ready to write-in a vote! Then, with all your might (maybe a little less if it’s a new computer or phone and you don’t want to destroy it, just for the sake of voting for The Little Red Publishing Hen), press that big, red Vote button! Step 5: Wallow in your part in L’affaire Chicken! And that’s it. Tell your friends, neighbors, Romans, countrymen. Send them here, which will send them over there. Download the book, read it (it’s free to Goodreads members and on the iBookstore), share it with your writerly friends (it’ll give you something else to talk about other than pitching them ideas for a story — and when you see the single solitary tear in their eye you know you’ll have hit a real nerve). Because precisely no one asked, I’m about to tell you the story of the odd little non-children’s story called The Little Red Publishing Hen. So grab a cup of tea and settle in, folks. I woke up a few weekends ago to the urgent call of nature — I had the ghost of a story lodged in my brain and I couldn’t get it out without the aid of pen and paper. 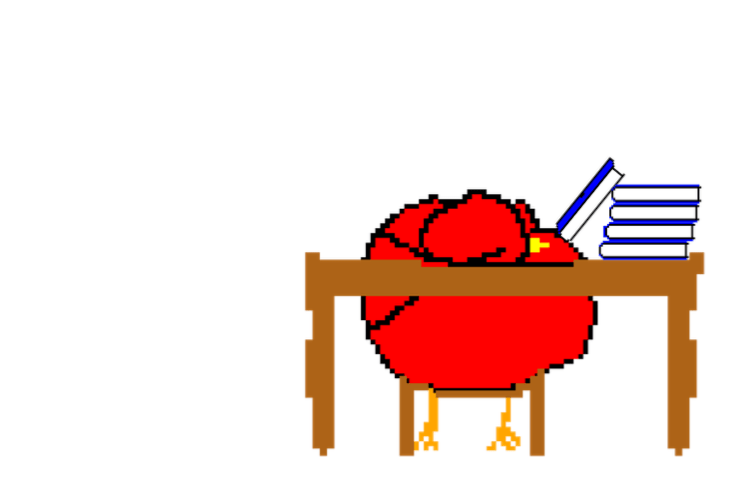 I imagined the little red hen, sick of all that baking, settling in to write a novel. Since writing is a solitary (ish) pursuit, she was in good shape, given the help she got in her baking. But imagine she got to the road to publication part of the process — the agent hunt, the search for a home for her book, an audience, a market. It’s been something I’ve thought a lot about as I’ve researched agent after agent, looking for someone who would be a good fit for Trip to the Quiet Room — a story about an ex-pro hockey player, his family, his old teammate, post-concussion symptoms, Old Sturbridge Village, and a time machine, amongst other things. Surprisingly, there is not a single agent who lists all of those things in their manuscript wish list. So I’ve spent a good chunk of time over the last two years crafting query letters, synopses, query packages for all sorts of different requirements; I’ve hit up old and sometimes tenuous connections for potential leads; I’ve pored over every entry in the PublishersMarketplace email every morning for new candidates and then dove into that agent’s background, previous sales, Twitter feed, Linked In profile, everything available to try and make some sort of connection. 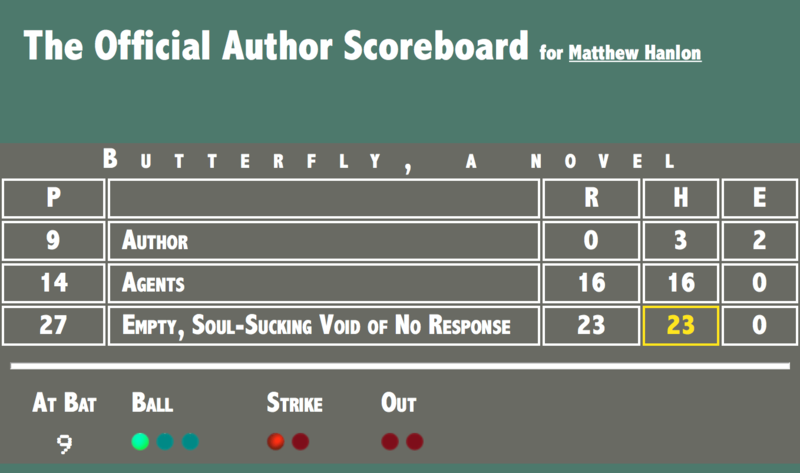 Because, as it’s so prominently highlighted on one of my scoreboards, the biggest foe you have to struggle against is that great, empty, soul-sucking void of no response. You begin to doubt your own existence, after so many emails sent with not even the hint of a reply, not even an auto-reply! So I imagined the little red hen running up against a familiar enemy, for her, and just getting on with it. She’d self-publish! In order to tell the story of the little red hen I pictured a pretty vivid set of colors, and while the kids did an amazing job on Verano the Fish, I didn’t want to go with the hand-drawn look for this one, going for a more Minecraft-y look (which is handy, as well, since my artistic abilities are lacking). I sketched out a few chickens for proof-of-concept purposes, and found I liked the look. I market tested them on the kids, and they liked them, too. So before I knew it I was blocking out the book, breaking the story up into short, bite-sized chunks that would need some sort of art. The better part of the weekend mornings, some evenings, mornings throughout the next two weeks were spent artifying the whole thing and fleshing out the book in iBooks Author, which is where I did all the layout of the text and pictures. During one of the reviews with the kids they highlighted a number of words they didn’t understand or thought might be improved, and we came up with the glossary, which is built into iBooks, so we chose the words they wanted defined and added those, as well as a single page glossary for the Kindle version. I wasn’t 100% comfortable pitching this as a children’s book, since it’s more in the vein of the thinly veiled frustrations of a writer comparing himself to a fat red hen than a pleasant bedtime read. I didn’t want an unsuspecting novelist-in-progress downloading this book only to break down in tears as they attempted to read the story to their children as they lay them down to sleep. I also didn’t want unsuspecting children to grab this book from the digital shelf and miss the light sarcasm and think that publishing a New York Times best seller was as easy as the book makes it out to be (or does it?). I didn’t want chickens to get ahold of this book, either, Doreen Cronin-style, and wonder where their laptop and writing desk was. I agonized about this for all of fifteen to twenty minutes, and decided to slap a subtitle, “A Storybook for Writers and Their Children” on it and be done with it. That should clear up any and all confusion. Some edits and off we go to the publishers! 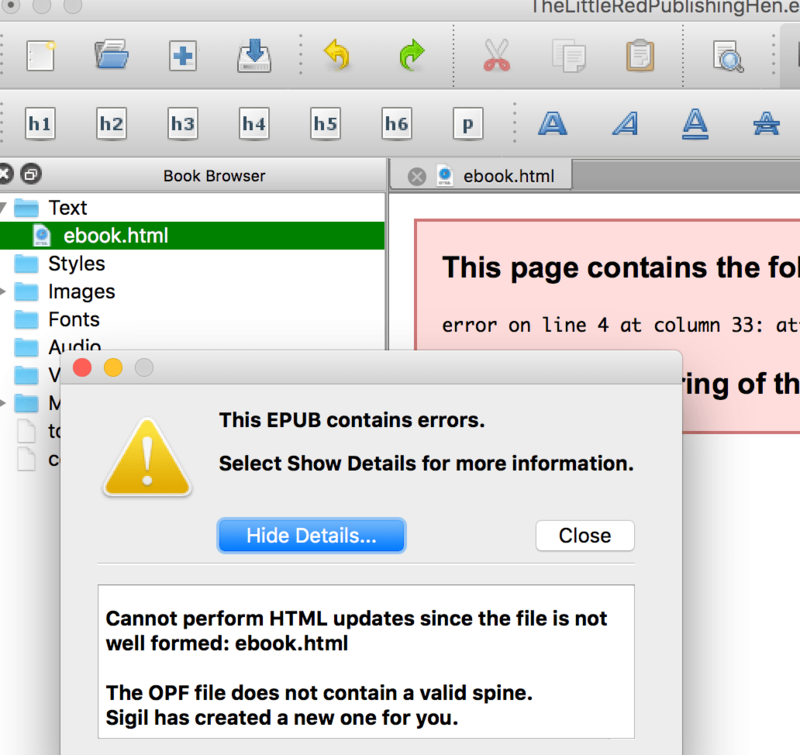 And then, as it says in the book, it was just a matter of pressing the ‘Publish’ button in iBooks Author. Well, pressing the button, remembering that I needed to provide screenshots, a decent cover, find the typo I’d missed in a hundred or so re-readings, then do it all over again for Amazon’s Kindle Direct Publishing program. And then do it all again with Barnes & Noble’s excellent NOOK Kids Book Builder, only to remember that the NOOK Kids Book Builder doesn’t generate a book that anyone can read! Then it was simply a matter of not caring about Barnes & Noble enough to spend a lot more time debugging the problem, and so I sat back, grabbed my (now cold) cup of Dunkin Donuts coffee, and watched the downloads pour in…. just like the little red publishing hen. 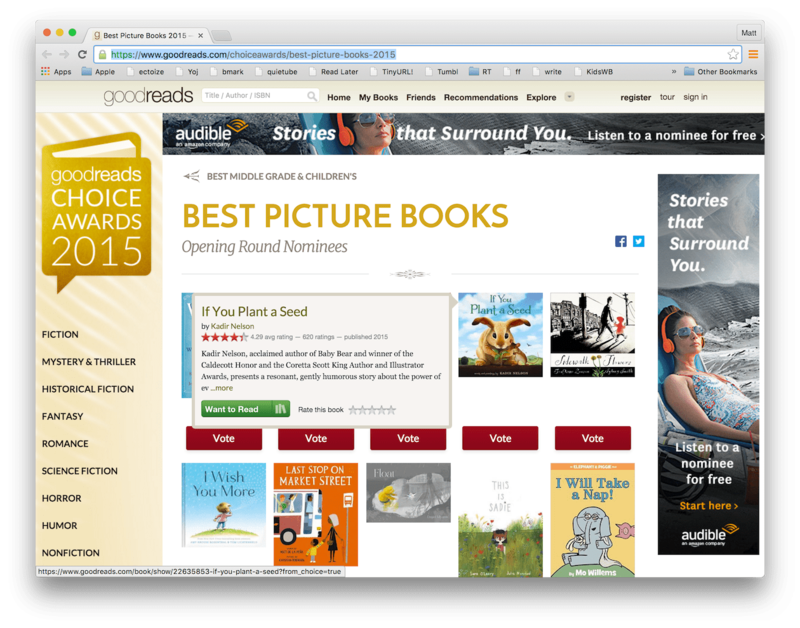 And then, and then, good friends, dear readers, as if fated, days after publishing this new picture book, the Goodreads Choice Awards 2015 opened for voting! 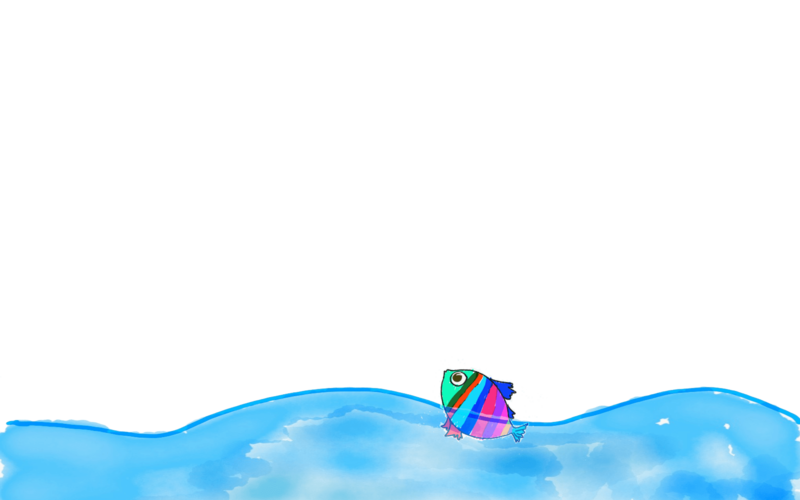 Now, last time out it didn’t work out quite so well, as Verano the Fish lost out to some very stiff competition. 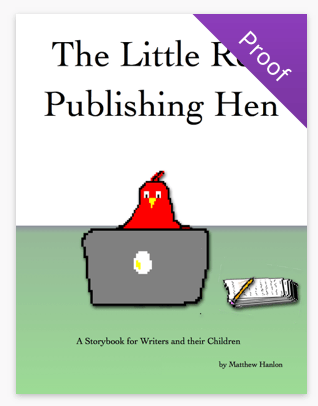 And this time The Little Red Publishing Hen faces some equally starched competition, but this time I think you’re ready. I’m ready. And the little red publishing hen is certainly ready to make that leap from competitor in the Goodreads Choice Awards to winner, Goodreads Choice Awards 2015. And while you’re there, vote for Claire North’s excellent Touch for best science fiction and David Mitchell’s Slade House for best mystery/thriller. Magic Funtime Butterfly Ranch: Now Accepting Orders? A Vote for The Little Red Publishing Hen is a Vote Against Big Picture! | Wombats Dig It on Vote for The Little Red Publishing Hen in the Goodreads Choice 2015 Awards! Please. Jamie on What Book Would You Read? What Book Would You Read? 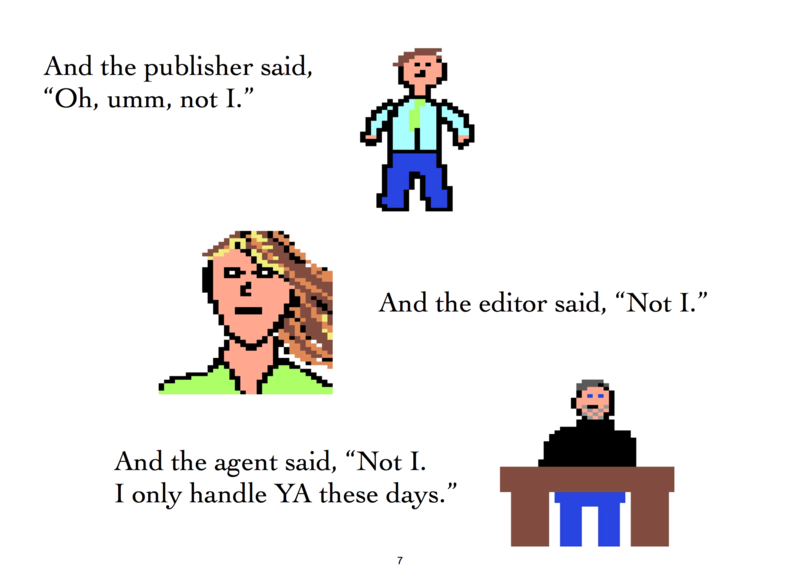 on Literary Agent News!